In earth retaining walls, vaults and many basements the problem is not that moisture is rising but penetrating from all around, thus a DPC would not be of any use as it only controls the rising flow of water through the wall by capillary action. Also the levels of moisture and hygroscopic/deliquescent salts are much higher than in walls suffering from rising damp, therefore the usual specialist re-plastering would not have the desired effect. Cavity drain membranes provide an alternative to conventional cementitious tanking systems, which work by holding the water back. Cavity drain membranes work on the principle of allowing water to continue to penetrate the structure but control it in the air gap and divert it to a suitable drainage point. They do not allow pressure to build up against the internal construction and the air gap behind the membrane allows the structure to breathe and to some extent to dry out. The membranes are lose laid on floors and fixed to walls using special plugs and sealing materials, with little or no preparation required to the substrate. Once the membrane has been fitted, wall surfaces can be dry lined or plastered directly and floors can be screeded or a floatingcavity drainage system dry board system installed. Guardian damp proofing uses ‘Tritons’ fully guaranteed sumps and pumps when installing Isola platon cavity drain membranes as a part of Guardians’ cavity drainage system. Once all groundwater that used to leak in from around the perimeter of your basement has been channeled, it needs to be directed to one spot and have some way of leaving your basement. This can be achieved either with a pipe that water flows through by gravity (downhill) to daylight, or the use of a sump pump to pump it up and out into an existing drainage system. 99.9% of the time, a sump pump is your best option. Despite any stories you have heard over the years about folks getting flooded because their sump pump was on the blink again, Tritons’ sump equipment is at the cutting edge of pump technology and incredibly reliable. Guardian damp proofing only uses Tritons’ products who provide the world’s best sump pumps available today. Single pump, battery backup pump, and triple protection pump to keep your basement dry ALL THE TIME. 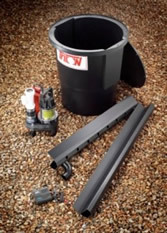 The system comprises Triton Aqua Channel (a PVC drainage conduit which is fitted around the perimeter of the floor) and the Triton Aqua Pump Kit (a mains powered submersible pump and pre-formed sump). The sump is located into the floor with the removable, structural lid finishing flush with the surrounding floor level. The submersible pump is then installed inside the sump and controlled by an automatic integral float switch. A non-return valve is available to avoid water backing up and a high level water alarm which warns of mechanical or power failure. A 12v Battery Back-up Pump is also available. The sump basin is 560 mm high x 460 mm diameter (base) and 540 mm diameter (top). Each 230v pump requires wiring into an independent fuses spur outlet within 1.5m of the pump.